When the subject of Chicago hip hop comes up, two things come to my mind: the fast rapping of groups like Do Or Die and Crucial Conflict and the pseudo-conscious rap of artists like Common and Lupe Fiasco. Kanye West is from Chicago, too, of course, but a lot of his more recent work doesn't seem very regional to me. Friends of mine from the Windy City tell me, however, that the underground scene is where the real Chicago sound can be found. My exposure to the Chicago underground has been fairly limited, but I recently got a chance to listen to a few of its artists thanks to one of the founders of the Chi-based indie label RhymeCity Records. I was sent a few tracks from the group J-Direct, composed of native Chicagoans Fitzgerald and Griff. "[Fitzgerald originally] hooked up with a then-unknown DJ J2K and together they began masterminding their takeover of the Chicago hip-hop scene. When it came time to record an official J-Direct album, the duo sought out Griff, an up-and-coming Chicago producer. Griff fit the bill working day in and day out with Fitzgerald while provoking creativity and direction for the album. While in the studio, J2KÆs interest started to drift out as he began collaborating with DJ Autobot and formed Flosstradamus. After coming to terms with the loss of J2K, Fitzgerald and Griff determined that it was best to move on. The duo has one simple goal for this record - to get all Chicago heads nodding in unison. Expressing much concern Fitzgerald states, 'ThereÆs too much segregation in Chicago - culturally, geographically, musically - everything. J-Direct is that one thing that all Chicagoans agree on. We bring all three sides of Chicago together.'" They also have a ten track preview of their mixtape Back 2 Fitzgerald, which you can download for free here (link to .zip file). 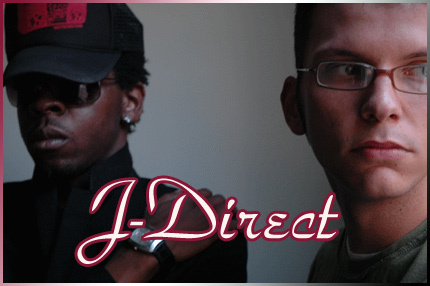 For more information on Live and J-Direct, their full length LP scheduled for a March 20th release, go to RhymeCity's website.